At first, it seemed a surprisingly amiable greeting in the midst of a broiling partisan turf war in the N.C. General Assembly in Raleigh. Al McSurely, a Chapel Hill civil rights attorney who directs communications for the N.C. NAACP, was offering a welcome to Dallas Woodhouse, the controversial executive director of the state Republican party, during a NAACP press conference Thursday morning. The good vibes didn’t last long. “This is the first meeting he’s been in for two or three days that’s not composed of all white people,” McSurely jabbed. Woodhouse responded that the comment was “disgusting,” and within minutes, the two would be engaging in a bizarre war of words mid-press conference about the history of partisan power-grabs in North Carolina. It was political theater at its most tense as protesters, lawmakers and stakeholders converged on the legislative building Thursday for the second day of a surprise special session convened after legislators approved a hurricane relief package. McSurely was part of a contingency of NAACP leaders gathering together hurricane victims who accused GOP leadership in the legislature of exploiting their plight to push through bitterly partisan power-grabs before the inauguration of Democratic Gov.-elect Roy Cooper. “If this is a special session to talk about hurricane relief, then why are we still here?” said Michelle Henry, a Kinston woman who said she’s been bouncing from home to home since the powerful storm wreaked havoc in her eastern North Carolina home in October. 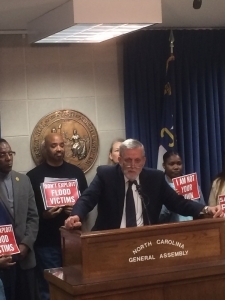 Flood victims and leaders with the NAACP called on lawmakers to adjourn their special session or vote down a torrent of bills filed in the hours after Senate and House leadership called for a surprise special session. “It’s 1898 without the guns,” said Derick Smith, a political action chair for the NAACP, likely referencing an 1898 violent uprising of white supremacists protesting local election results in Wilmington. “This is not Democracy at all,” said Smith. Meanwhile, Senate Democrats, including lawmakers representing some of the most hurricane-battered districts in the state, joined the NAACP in lambasting the special session. Sen. Erica Smith-Ingram, a Democrat representing eight counties in northeast North Carolina, shredded Republicans for indicating they were proposing bipartisan reforms. Meanwhile, House and Senate lawmakers are scheduled for a busy day of committees to consider the spate of surprise bills on the table. The House will reconvene at 1 p.m. and the Senate will return at 2:30 p.m.